The California Grand Jury Association (CGJA) is a statewide organization whose purpose is to support the California grand jury system and the valuable role civil grand juries play in our democratic system of government. In 2013, San Joaquin County joined 27 other counties in the state that have Chapters of the California Grand Jurors’ Association. The San Joaquin County Chapter will extend the state organization’s role for the benefit of county citizens through increased oversight regarding accountability and effectiveness of public entities including cities and special districts. The purpose of the San Joaquin County Chapter of the California Grand Jurors’ Association is to tell the story of the Civil Grand Jury and to support the efforts of each year’s Civil Grand Jury. Promote greater awareness of grand jury reports, including meaningful responses by local government agencies. 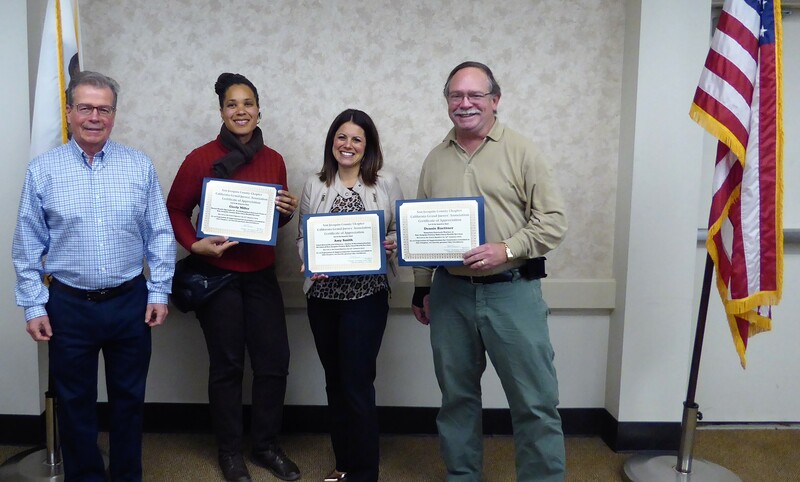 January guest speakers were Amy Smith, Cicely Miller and Dennis Buettner. Amy Smith is a Chief Mental Health Clinician in the Justice and Decriminalization Division where she manages the Homeless Outreach Programs, Mobile Crisis Support Teams and various community projects. She graduated from California State University, Fresno with a Bachelor of Arts Degree in Social Work. She then went on to obtain a Master of Science Degree in Counseling with a specialization in Marriage and Family Child Counseling at California State University, Sacramento. She is also a Licensed Marriage and Family Therapist and have been working at San Joaquin County Behavioral Health Services for the past 5 ½ years. Cicely Miller graduated from CSU Stanislaus with a Bachelor’s Degree in Criminology and a minor in Sociology. She also obtained a Juris Doctorate Degree from Humphrey’s College. For the past 12 years she has worked as a Mental Health Specialist II assigned to the PATH Homeless Outreach Team. Dennis Buettner is a Homeless Outreach Worker and has been working with the homeless for San Joaquin County Behavioral Health Services since 2002. His education background includes an A.A. in Social Sciences – San Joaquin Delta College, a B.A. in Psychology – University of the Pacific, and graduate work in Psychology – University of the Pacific. He has been working with disabled individuals since 1988 when he began working for the Community Re-Entry Program at the University of the Pacific, serving the mentally ill and then spent ten years working with the developmentally disabled.